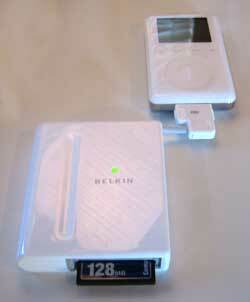 Rethinking a Recommendation: Should You Buy Belkin's Media Reader for iPod? Over at the fine Digital Photography Review site, forum members are continuing to grouse about slow transfers from the Media Reader. It appears they have something to complain about. The Media Reader appears to have very slow transfer rates that become unacceptably slow if you're working with huge image files. Based on this, I've revamped my conclusion and recommendation for the Media Reader. My current stance is thus: If you work with high-capacity memory cards (512MB and up) and very large files (images in RAW format), you may want to pass on the Belkin Media Reader, at least until Belkin addresses what appear to be some genuine performance problems. However, if you work with smaller-capacity cards and smaller files (for example, JPEG images from cameras that shoot 4-megapixels or less), you probably won't be bothered by the Media Reader's slow transfer speeds. Here's hoping Belkin or Apple or somebody releases a firmware update that makes this appealing little device a winner for every digital photographer. First, the iPod was a music player. Then it became an address book and calendar, too. Now it's also a photo shoebox. Belkin's $99 Media Reader for iPod enables Apple's more-than-a-music-player to store photos from all common digital camera memory cards. Fill up your memory card while you're in the field? Simply copy its photos to your iPod, then erase the card and start shooting again. When you get back to your Mac, connect the iPod and copy the photos into your iPhoto library. It's a great alternative to taking a laptop on your next vacation just to have a place to park your photos. I've been working with the Media Reader for iPod, and so far, I love it -- even though I haven't yet succeeded in getting iPhoto to automatically import photos from my iPod. The Media Reader for iPod requires iPod Update 2.1, so my first step was to install it. After reading some horror stories on Apple's iPod discussion boards, I was worried that installing the update would render my iPod unusable. The Media Reader is slightly larger than the iPod itself. All glossy and white, it's an attractive little gizmo that complements the iPod nicely. The back of the reader contains a retractable cable that attaches to the dock connector on the bottom of the iPod. Alongside the retractable connector is a door that houses four AAA batteries, which are included. Around front is a little garage door: slide it open to reveal slots that can accommodate a Compact Flash card (including an IBM MicroDrive), a Memory Stick, a SmartMedia card, and more (see the full list at Belkin's site). The Media Reader doesn't require you to install any additional software on your Mac. For my tests, I copied some photos and movies taken with a Canon PowerShot S330. I removed the Compact Flash card from the camera, inserted it into the Memory Reader, and my iPod displayed a screen listing how many photos were on the card and containing an Import command. In this test, I was importing two-megapixel images. On average, each image took between one and three seconds to import. That isn't exactly speedy, but remember, Compact Flash cards are a relatively slow form of memory. After importing one set of photos, I inserted a second Compact Flash card into the Media Reader and imported its images, too. After you import some photos, the iPod's Extras menu gains a new command: Photo Import. Choose this command, and the iPod lists each roll that you've imported. The rolls are simply named numerically, and the number of photos in each roll appears after its name, as in Roll #1 (23), Roll #2 (15), Roll #3 (56). If you choose a roll's name, the iPod's screen changes to display the number of photos in that roll, the date you imported them, and the amount of disk space they use. This screen also contains a Delete Roll command. At no time can you actually view the photos on your iPod's screen. The Media Reader turns the iPod into a photo shoebox, not a tiny picture frame. It's great having all that photo storage on your iPod, but at some point, you're going to want to move the photos into your iPhoto library. Here's where I've encountered a potential glitch, and I'm still researching the answer. From reading other reviews and Belkin's own support documents, I'm under the impression that you can use iPhoto or Mac OS X's Image Capture program to bring photos in from a connected iPod. This isn't working for me. Neither iPhoto nor Image Capture recognizes the iPod, and I've tried it on two different machines. Stay tuned for updates. For now, I'm copying images manually. When you activate the iPod's FireWire disk mode, you see a folder named DCIM. (This is a standard naming scheme that virtually all modern digital cameras use.) When I dragged that folder into my iPhoto window, iPhoto imported the photos, storing each set of photos in its own roll, just as you'd expect. Although the iPhoto-import issue still has me stymied, I'm impressed with the Belkin Media Reader for iPod. It's beautifully integrated with the iPod's software -- if you know how to navigate the iPod's menus, you know how to use the Media Reader. I'll post an update regarding the iPhoto-import issue as soon I as learn something. In the meantime, I recommend the Belkin Media Reader for iPod with some reservations, as noted in the posting above. UPDATE: According to a discussion on Digital Photography Review's Web site, the Media Reader is painfully slow when transferring large files. Belkin appears to have acknowledged a problem, though when and if any problem will be resolved is still uncertain. Meantime, if you plan to transfer extremely large files -- for example, high-resolution photos in RAW format -- you may want to think twice about the Media Reader. Posted at noon Pacific time, October 24. I also recommend my free iTunes 4 and iTunes Music Store update: a PDF file containing 18 full-color pages in the same gorgeous design as The Macintosh iLife book. Get your update here. At a special event at San Francisco's Moscone Center, Apple today introduced iTunes for Windows as well as iTunes 4.1 for the Mac, a minor update that enables music synchronization between the Mac and Windows versions of iTunes, provides enhanced burning features, and a few more goodies. iTunes 4.1 is a 10MB download. But that isn't what has my heart thumping and my charge card itching. No, what's making me smile is the announcement of the Belkin iPod Media Reader for third-generation iPods. This compact, $99 add-on plugs into the bottom of the iPod and enables the little music player to download and store photos from all common digital camera memory cards. Connect the iPod to your Mac, and you can use iPhoto or Image Capture to import the images. I've been longing for a device like this ever since I schlepped my PowerBook G4 on a trip to Hawaii just so I could have a method of downloading photos from my digital cameras. Belkin also announced a voice recorder add-on for the iPod. That's swell for folks who need such beasts, but as for me, life is all about the Media Reader. 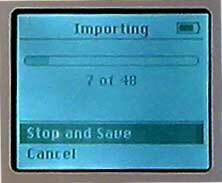 Note that the iPod Media Reader (and the voice recorder) require iPod Software 2.1 Updater, now available for downloading. According to Apple, the new iPod software also "includes faster browsing and accessing of large music libraries, the ability to sync On-The-Go playlists back to iTunes, and a new Music Quiz game which tests a player�s knowledge of their own iTunes music library." Music Quiz? Hey, why not? The ability to sync On-The-Go playlists back to iTunes? Yessss. I've longed for this, too. Stay tuned to this site for more information on iTunes 4.1. Now if you'll excuse me, I have an order to place. A reader writes with a question that seems simple at first: "How can I add new pictures from iPhoto to an existing .Mac HomePage album?" The answer isn't simple at all. You can indeed add photos to an existing album, but it's an awkward process that Apple should streamline. In short, you have to open your iDisk, find the folder that corresponds to your album, and then copy the new photos to that folder. Step 1. Choose iDisk from the Finder's Go menu, and type your .Mac name and password when prompted. Step 2. On your iDisk is a folder named Pictures. Open this folder. Step 3. Within that folder is another folder named Photo Album Pictures. This is where your HomePage album photos live. Open this folder. Step 4. Within the Photo Album Pictures folder, you'll find even more folders -- one for each of the albums you've created. Unfortunately, the folders have weird names consisting of dates and times (for example "2002-04-13 12.20.42 -0700"). If you have a lot of albums, it isn't exactly easy to determine which folder matches which album. I used trial and error: I opened a folder then double-clicked an image to see if it was from the album I wanted to change. Step 6. Go into .Mac's album editor, rearrange the order of the photos as desired, and click the Publish button. Even if you don't need to rearrange the photos, you still need to go into the editor and click Publish. Otherwise -- at least according to my experiments -- the new photos won't appear in the album. Whew! That's more work than it should be. Here's hoping Apple makes this process easier in the future. At the very least, those album folders should have names that somehow reflect with the name you've given to an album. Yes, it's been a while since I've posted any dispatches here. I thank everyone who has written in asking when the next updates are coming. Right now, I'm writing to explain my absence over the last couple of months and to make an announcement. Effective with the November 2003 issue (just hitting newsstands and subscriber mailboxes now), Macworld magazine will be running a new, monthly column by yours truly. Called "Digital Hub," the new column will include tips and project ideas for iLife and other video, photography, and audio tools. So that's where I've been -- working hard to launch a new column about the programs and subjects I love. I wrote a monthly column in Macworld for 11 straight years back in the 1980s and 90s, and I'm looking forward to returning to the magazine as a regular again. And what about this site? Check back next week -- I have a nice little series of dispatches planned.